Tra La La. 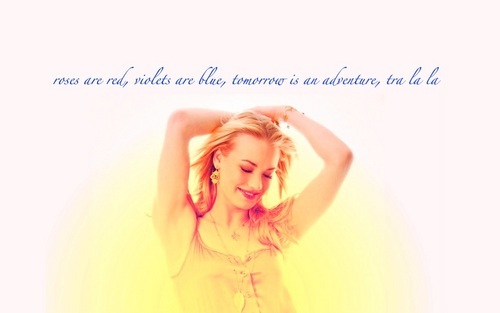 Quote/poem from Yvonne, via her Twitter account.. HD Wallpaper and background images in the Yvonne Strahovski club tagged: yvonne strahovski actress photoshoot saturday night magazine poem roses are red violets are blue tomorrow is an adventure tra la la twitter wallpaper. This Yvonne Strahovski wallpaper might contain پورٹریٹ, آرچر, closeup, تصویر, and ہیڈشوٹ.